Someone Hand This Movie a Tissue, It’s Been Crying for Two Hours. Prepare yourself; this is an emotional movie that hits for the most part and you definitely don’t want to be the person that doesn’t at least shed a tear and be accused of having no soul and love to point at and make fun of dogs. Let’s get reel and break this down. Director J.A. Bayona tackles the dark reality of losing a parent from an illness through the eyes of a kid who is in the middle of his youth and doesn’t fully know how to comprehend his emotions very well and you can feel the pain and suffering he is going through. Bayona balances the use of the fantasy world to showcase an escape of the issues while embracing him for his harsh reality and the real world to show an emotional depth and connection he has with his mother, father, and grandmother. While the acting is convincing, the mother and the father are a bit underdeveloped. Yes, the emotional turmoil is there but I felt a bit of disconnect because I didn’t feel the gravity of the situation as much as I should, given the subject matter. Lastly, this film doesn’t have a good re-watch value either, unless you like to cry for two hours straight and have your eyes dry out. As stated above, everyone is wonderful and the kid, played by Louis MacDougall, really surprised me and came to play with the fantastic actors and actresses around him. 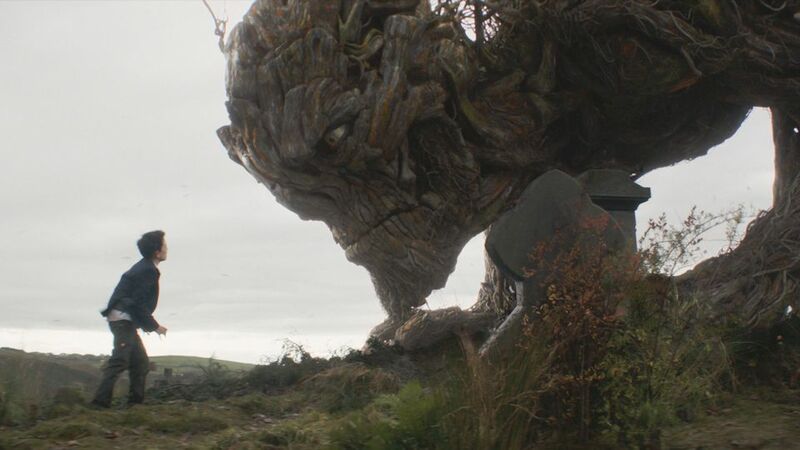 Oh, I also believed he was talking to this glorious tree voiced by Liam Neeson. Neeson’s voice has a level of comfort but also a stern, upfront approach to not sugarcoat the situation the son is going through. The fantasy and day dreaming world is haunting yet inviting. The real world is grounded yet bleak. Both worlds are wonderfully shot and the colors definitely pop out of the fantasy world giving a fable like tone and atmosphere. The two hours have a moderate pace to the story, despite it being emotionally heavy. The material is given time to breathe. The special effects are beautiful and detailed, especially from the monster. Some of the green screen is noticeable, not bad to take you out of the movie, but it might take you off guard. Despite some emotional disconnect issues, this is an emotional ride with some great performances and beautiful cinematography and effects. Alright, Bayona, I have seen what you can do with effects with a giant Liam Neeson tree but now I am curious to see how good the effects will look for when you do Jurassic World 2.